To Help Save A Child's Life? Dr.Mani's "47 HEARTS - How To Live Your Dreams"
Your Dreams - And Mine! "47 Hearts" will show you how to take charge of your life, pursue all your dreams, and find deep soul-satisfying happiness... by sharing 47 powerful axioms. Click here to read it now! And hundreds of readers love its simple message - of hope. I'm Dr.Mani. I write and sell ebooks to raise money that funds life-saving heart surgery for under-privileged children born with congenital heart defects. So far, we've sponsored over 100 operations. But there are thousands more still waiting for a chance - to live. To help give them that chance, I'm asking you to buy my ebook from Amazon.com today. But first, let me explain what's inside the book - and why you should read it. "47 Hearts" is about dreams. Your dreams. And mine. It shares 47 simple yet powerful principles that will guide you towards making your dreams come true. It's concise and short. If you have only 10 minutes a day, then you'll be done reading it within a week... and feel energized in your pursuit of even "impossible" dreams and progress towards your goals. - With Passion, Purpose & Persistence! Yes, YOU Can Live Your Dream Life! "47 HEARTS" is about how you can take charge of your life, chart your own course to meaningful achievement, and reach your goals with just 47 simple, yet powerful principles.... while having fun all the way! 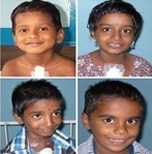 Heart surgeon and infopreneur Dr.Mani Sivasubramanian writes and sells ebooks to raise money to fund life-saving heart surgery for under-privileged children born with congenital heart defects. What if you don't have a Kindle ebook reader? Well, you can still read "47 HEARTS" on your computer (PC or Mac) using the free Kindle app - or I'll send you a PDF version when you email me your order receipt. When you buy "47 HEARTS" you will be helping save a child's life! Join us today! "Dr. Mani's new book is a GEM. Actually, let me correct it - every page in the book is a GEM"
"A system for making a real difference in the world. Everyone needs to read and practice the "47 Hearts Way." "...the key to opening the door to all of our dreams: 47 steps to live by to achieve anything we want." "Everything in the book is drenched in simplicity, practicality, honesty and sincerity." "A 'mini treasure chest' of golden nuggets of information required to achieve success in any shape or size." "Reaches deep inside one and gently blows on embers that might have almost died on dreams long forgotten." "A great book, one that can encourage, inspire, and hopefully motivate you to pursue your dreams." "It's very inspirational and the format is nicely suited to help people make it through obstacles and tough times, find and pursue their dreams"
"A beautiful book, for a great cause, with a great message." "This book is a shot-in-the-arm for anyone who needs a little reminder about why they're doing what they do, and the meaning and purpose behind the daily grind. I defy anyone to real 47 hearts and not feel a resurgence of the excitement, the passion and the determination they felt when they started down their chosen path." "I loved this little book! It inspires and uplifts, something very much needed in today's stress-filled world. The best part is that it helps you see ordinary things in a more beneficial way. It gives a fresh perspective on things you may have thought could only be seen one way. I will definitely advise people to read it." "47 Hearts is an excellent collection of infinite wisdom. You share in a powerful and concise way success traits that will lead us on the path to greatness. I enjoyed your book very much and could not turn the pages fast enough. I look forward to sharing 47 Hearts with my friends and family." "This is a terrific and powerful book that will help you find and follow your passion. This book will take you by the hand and help you discover what your passion is. If you know it already, it will help you live your life of passion. Enjoy this book and take action on its contents. It could change your life." "I loved the simplicity of how the story was put together. Yet the story is admirable and also gives you the opportunity to learn valuable lessons and how to give to others and to the self. '47 Hearts' is a book for daily living and daily inspiration. I love it, I appreciate it, and I know you will too when you read it." "Dr Mani conveys such passion that I can feel the warmth of those 47 smiling little hearts through his words. He shows us how his dedication and resolve has achieved so much and continues to grow apace. When your resolve is tested as it can so often be, let the words of Dr Mani and the stories of those brave little souls for whom "failure is not an option" be your touchstone. " "I liked this refreshingly to-the-point book, unlike so many self-help and attain-your-dreams books which are so long winded that it is often difficult to extract or remember any useful materiel. Thankfully, bereft of psycobabble and bucketloads of self-indulgence, 47 Hearts is compact. '47 Hearts' is a useful, short aide-memoire and starting point if you have a dream to help others, but have yet to fulfill it." "After reading Dr. Mani's book, '47 Hearts', I could import my dreams from the clouds and give them a concrete shape with a well-defined plan including a time frame. I think every home, every school and every psychologist should have copies of this book to be lent out and given as a gift. The language of the book is simple, crisp, positive, motivating and inspiring that makes it easy for influencing young minds who need the maximum support." "This one was different, it was more about inspiration. Usually it could take days, weeks or even months before I'll finish an ebook. '47 Hearts' was different. I read straight through half of it, and came back to finish it off the same day. I love the way you've formatted the pages so I don't have to scroll, and it is a very easy read." "I liked the fact "47 Hearts was short and concise. I read "47 Hearts" upon rising, ie first thing in the morning and just before going to work as it just seemed the right time. Am I glad I did. Throughout the day "47 Hearts" made me feel uplifted and hopeful for the future of all children with heart defects. "47 Hearts" made me reflect on my life and how lucky I am to be alive. I have a positive outlook on life most of the time, but more so now. thanks to "47 Hearts". You made me aware that all goals set could be achieved through perseverance, that, you shared with us generously. Thank you for giving me the opportunity to read and review book. I'll certainly pass onto like-minded friends and colleagues who need upliftment in their lives." "Maybe you have a dream to pursue. Maybe you don't ... but wish you did. '47 Hearts' brings you a collection of thoughts and ideas for identifying, pursuing and bringing your dream to fruition. Many people who read this book will have also read other books or attended self development courses. If you have, there may be elements of this book that give you that "I know this" feeling. What I like about this book is that each suggestion or reminder is small enough to digest quickly but big enough that putting it into practice will make a difference in your life. The only true test of whether you "know" something is whether you actually practice it. 47 Hearts will remind you to think about what is important - in YOUR life. Thinking about this and living consciously - making different decisions because of that - will make a massive difference in your life over time. This book reminds us that one person working steadfastly to change their own little corner of the world can send out ripples that affect the lives of many. Will you?" "The book had each section very easily described and good to read with easy points to follow and tools to put into place. I have read the book and would certainly recommend it to people and put what I have learnt into practice." 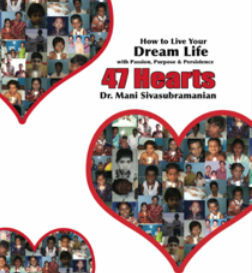 "47 Hearts starts by briefly taking you through Dr Mani's inspirational story of how he started with nothing but a dream and has built this dream up to saving 47 children with Congenital Heart Defects. This in itself is inspirational but he then shares 47 nuggets of truth for success and motivation that he has learnt along the way on his admirable journey. Each nugget is distilled into it's raw form and has applicability to all areas of life and all shapes and sizes of dreams. This book makes a good read for immediate inspiration but I can see myself flicking through this book from time to time to recap and discover new words of wisdom or reinterpret existing truths." "Yes! I read the book, "47 Hearts" and I was extremely moved. I was especially impressed with the parrallel of the principles of attaining one's goals and your application of them in attaining yours. God knows that this life is not easy, just getting through it can be a hardship. I can't imagine being faced with such problems as those children and their families have encountered, but thank God for you because he is using you and the lessons you have learned, along with your carefully practised skill to help them tremendously and to get a chance at life. We should take heed of the message you are sending us and apply these principles in our lives. May God continue to bless you, Dr. Mani, for indeed He has." "The book is inspirational in general terms about identifying a goal and sticking to achieving it and in terms of the good work that can be done for others. Whilst making money is important for us all to survive, it is also important that we devote some of our surplus money to those who, by accident of birth and fate have less than us. I was directed to this book by Jason Fladien, an internet marketer in the US who is obviously successful through hard work and perseverance. I wrote to him to tell him how pleased I was that he had the humanity to recognise that others need our help because they have nothing. I am really pleased to see that someone like Kevin Riley is a supporter of the Foundation and contributes to it. It gives me faith in people sharing some of their success." "In this age of information overload, Dr Mani gives us a little gem of a book for anyone chasing their dreams. Part inspirational story, part informal 'rulebook', there are 47 short statements, illustrated from Dr Mani's journey to save the lives of 47 children through his Foundation for children born with congenital heart defects. Each of the lessons can be applied by anyone, whatever your dream. Sure, you may have heard some of the mantras before, but the clarity, lightness and brevity of writing makes this an easy book to access. Read it in one sitting or keep it by your elbow for an instant pick-me-up or if you need to refocus your efforts to reach your own dreams. Thoroughly recommended." "After twenty plus years of experience in the not-for-profit sector and my recent struggle to launch a new project that already has taken me more than 24 months to get going, '47 Hearts' has been a welcome injection of wisdom. Although sceptical at first, but willing to read the book just for the sake of supporting Dr. Mani's good cause, I was pleasantly surprised with the concise information that I got from the book. '47 Hearts' highlights pitfalls and success factors for any kind of good cause or project and hence makes a worthwhile read." "Your new book is great for anyone that wants to keep an easy to read, easy to access 'mini treasure chest' of golden nuggets of information required to achieve success in any shape or size. Read it all at once or dip into it when you have 5 minutes and the effect is a positive one. Marry that with the outstanding cause and work behind the book and you have created something very worthwhile and commendable. I hope everyone reading this gets a copy or two of your book and in doing so brings your 47 Hearts intention that much closer to becoming a reality." "Dr. Mani's book reaches deep inside one and gently blows on embers that might have almost died on dreams long forgotten, or neglected, slowly bringing them back to a small flame at first...until, with each page, the small flame grows brighter and stronger, until you, too, begin to believe in miracles again. If one person can do it, so can we all....one heart at a time." "If you're after a self improvement book this is not it. What 47 Hearts does offer, however, is concise & thought provoking statements that make you stop & think. 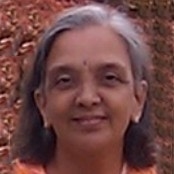 Dr. Mani's passion & drive reach out to you from the pages & encourage you to take stock of your own situation." "Dr.Mani's book is really amazing and it is one of the books which have touched my heart and soul. I am very sure that whoever reading this book will definitely find something that they have missed in their life. Once again thank you Dr.Mani for giving me such an incredible chance to grab this life-changing book. I wish you that may the purpose of publishing this book will become true." "This is such a wonderfully inspiring book! I love the simple, yet powerful message it conveys. There is no need to make your goals complicated. Just follow your passions and you will succeed. Thank you so much for such an amazing book!" "I have read the 47 hearts. It should now be called the 48 hearts because it touched my heart." "47 Hearts is a wonderful motivational book. Dr. Mani is very passionate about his dream, and he encourages us to be passionate about ours. A great book, one that can encourage, inspire, and hopefully motivate you to pursue your dreams." "I love your book. It's very inspirational and the format is nicely suited to help people make it through obstacles and tough times, find and pursue their dreams, and more. It's also perfect for taking one page a day as a daily inspiration! I also love the way you tell your story and what brought you to your life's mission, what you have achieved so far, against very high odds, and how you tie it in with your inspirational section." "This book is a propeller for you to do what you have always procrastinated on yet have believed in all your life. I'll vote this the best book of the year." - Wangari I. K., Nairobi Kenya. "This book is a must read. Whoever is trying to make a difference, feeling a little down, needs a pat on the back, needs some motivation and inspiration or if you are into books written straight from the heart - you have got to read Dr. Mani's 47 hearts. This book left me touched and inspired and gave me the kind of energy I hadn't felt in a long time. "Those of you thinking of buying the book, don't think... just buy it. I wish Dr.Mani all the best, may he save countless lives through his great work and I wish those children wonderful, successful, happy and healthy lives." "I was somewhat skeptical about this book as I have read literally hundreds of so called self-help or motivational books over the years. However I was pleasantly surprised with your 47 Hearts as it was both motivational in abstract terms and motivational based on what you are striving to achieve. I would have no hesitation in recommending your book to anyone who has started on a journey but who needs to have the pathway re-illuminated." Dr. Mani is a very good role model for living a "bigger life". "Bigger" not necessarily in terms of action, adventure, making or spending a lot of money. One key of happiness is purpose. Now, let me try to condense my feelings into one little paragraph: "Once you start caring about other people and set out to help them in a true generous way, that's when the real rewards start to happen. Rewards that not even all the money in the world can buy." I am sure that you will think a little bit differently about your own life and your relationships after having read 47 Hearts. It will put a smile on your face and make you think about your choices more consciously." "47 Hearts is a wonderful motivational book. The title comes from the 47 surgeries that have been sponsored for children that have congenital heart defects. Dr. Mani shares with us many motivational and helpful tips. The motivational tips are short and to the point, but they are inspiring, particularly considering his goal of saving thousands of child's lives. One of my favorite lines of the book is this: "Where passion meets preparation, your path to success becomes interesting, enjoyable and fun." He talks about how the journey is just as important as the destination. Dr. Mani is very passionate about his dream, and he encourages us to be passionate about ours, and also to guard it against being lost prematurely. He also encourages us to be grateful for what we have, and to consider how blessed we are when compared to 99 percent of the rest of the world. A great book, one that can encourage, inspire, and hopefully motivate you to pursue your dreams. " "Dr. Mani has done it again! "47 Hearts" is beautifully written and brimming with multiple motivational messages that will inspire you to reach out and grab that brass ring with both hands! Dr. Mani's latest book will speak to you on a deep, inner level and will ignite the passion you have within you that knows, without a doubt, that yes, you can soar with the eagles - just take the leap and build your wings on the way down! Life is full of possibilities and "47 Hearts" will show you how to find them!" "47 hearts" gives you a unique perspective of the author, pediatric cardiac surgeon Dr.Mani Sivasubramanian, in his pursuit of helping underprivileged children to receive life-saving heart surgeries. But it is much more than that. Through his own experience he dares us, his readers, to dream big, to follow our dreams, to stay the course when things are not going as planned, to cherish our small victories and to look forward to a big prize. Truly inspirational, the book is filled with lessons of personal experience that give you desire and motivation to devote your life to something you really care about and find balance and happiness in the process. "47 hearts" is not a "read it and forget it" kind of a book, it is something to read and reread many times until you truly embrace these lessons. If you are a dreamer looking for a guide to help you along the way, to motivate you when you are in doubt, to give you the power to believe that you can accomplish anything, this book is for you." It was a privilege to read your book. I can tell you that this was one of the most inspirational books I have read recently - a must have in one's daily-reading list! The 47 nuggets of wisdom you've shared in this little book has given me a fresh boost of motivation to chase my dreams and has also clarified my thoughts to evolve a workable plan-of-action for realizing them. Interesting, a bit funny, exciting, even a bit more disturbing and challenging one- All in one combined with gentle human touch. It provides the distinctions that add value, meaning to the life. Advice on page 33 is for the confused lots, and see for yourself whether you can pass the acid test. It assures you good things are possible even in heavily resource constraint situations. Very sensible, direct, pithy, succinct, to the point and practical advice and pertinent questions for the lifepreneurs. Not for a hurry read or quick read. It helps you to check for yourself. It is a kind of book that requires repeated reading and intellectual chewing although appears direct and simple. Although easy to read, however, takes time and energy to make best use of the points raised. You will be informed of what is going to happen or how things will turn into. 47 Hearts is a beautiful read that will inspire and touch your spirit each time you read it...and, this is a book you'll reread more than once! Don't let the simplicity of the 47 axioms fool you; with them Dr. Mani gifts you with gems that match your passion and purpose with your actions increasing your efficacy and sense of peace. Using his own dream and the 47 little hearts as a template is an ingenious method of sharing with his readers that you can use these steps to model your own dreams and plans of action. Now that the kindle edition is available there's no reason not to grab a copy, and here's an idea; if you feel so moved why not donate the money saved to help one more little heart? One of the best motivational books I have read. I love the way you formatted it with short segments. Although I read through the book pretty much straight through, I look forward to going back and reading one page a day so that I can really meditate on what you have written. Reading your book has encouraged me to more seriously work on the causes that are dear to my heart. Imagine tiny hands wavering helplessly in the air. Now envision the weary mother, who bows down over her child, sadly knowing in her heart that her child might not live to see his first birthday. Then see a young Doctor with a dream - a passion. He took those valuable qualities, and he changed the life not only of 47 small children with congenital heart defects (CHD), but also of their parents and siblings. In "47 Hearts" Dr. Mani shares his passion with the reader, and he inspires the reader to reach high and find his own passion. With passion, you can obtain everything - even save the life of a little baby. Dr. Mani has raised thousands of dollars to save the lives of those children, and he aims at saving many more. 100% of the profits from this book's sales go to fund a child's heart surgery. You can afford to pay for this book. Can the price ever be compared to the pain of losing a child? Get this book, and find your own passion and purpose in life. Copyright 2010-2011, Dr.Mani. All rights reserved.